← What is the Simple Life? Everyone can think of a “comfort food” they turn to when feeling a bit needy. I love anything related to bread or dough and this recipe is quick, inexpensive, and easy. 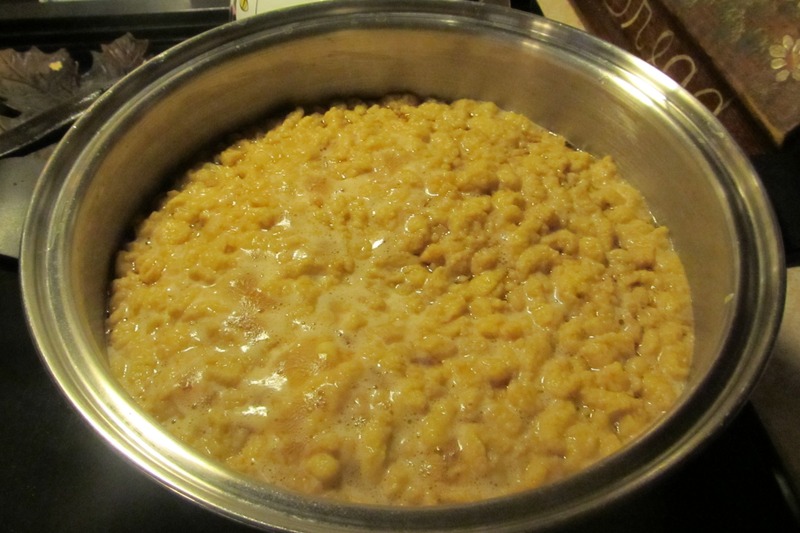 I’d like to share a recipe for Spaetzle (pronounced spehtzl), a German soft noodle that takes only minutes to make. You will need to purchase a spaetzle maker as seen below. I tried everything in my kitchen to make it without the device and was sorely frustrated! Purchase price begins around $10 dollars for a maker like the one shown below. They are worth every penny if you like to make and eat spaetzle! 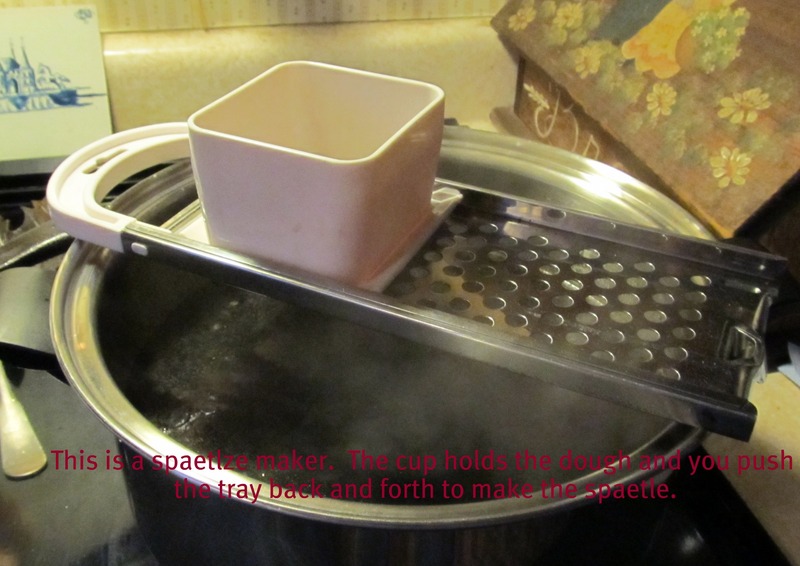 You put the dough in the cup and slide back and forth over the grate to form the spaetzle. Make sure the broth or water is at a slow boil. The ingredient list is short and preparation time is minutes. Mix all ingredients at once in mixing bowl until batter is smooth. Beat for a few minutes extra to lighten the batter and help it rise. This dough is at the correct texture to begin making the noodles. 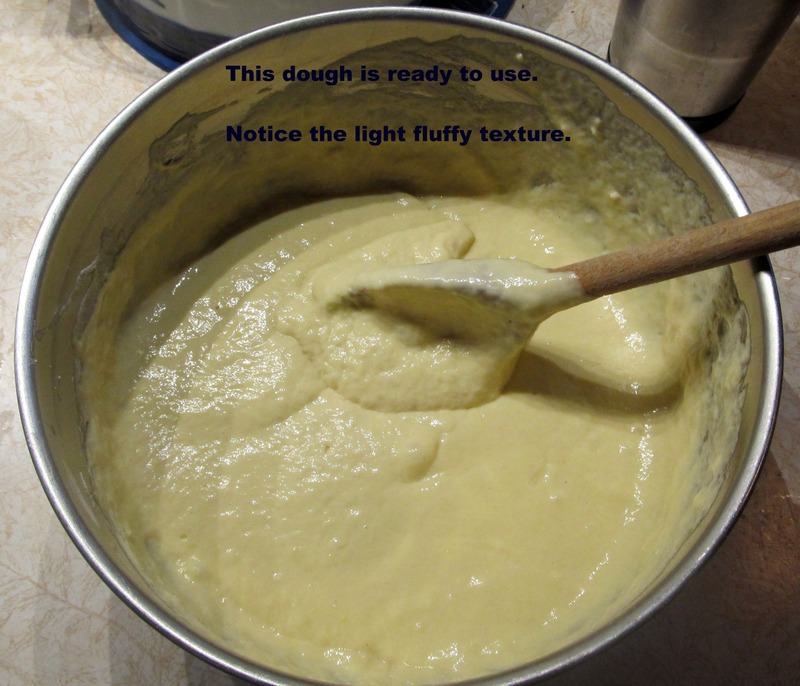 The dough becomes light in color and a bit elastic. Pour into the cup of the maker and slide back and forth into a kettle of either boiling salted water or your favorite broth. Stir the noodles so they don’t stick to the bottom or clump together. Continue to make the spaetzle until all dough is gone. Stir again to ensure the noodles are not sticking together and let boil until they fluff up and rise to the surface of the broth. This only takes a few minutes at most. Taste test to make sure they are cooked through; then drain and pour into a serving bowl. Add butter, olive oil, gravy, parsley or spice of your choice and stir up a great side dish. Tonight I sauteed some onions and thinly sliced beef steak until tender, seasoned to taste and mixed with the spaetzle to make a delicious quick supper. This is comfort at it’s best! 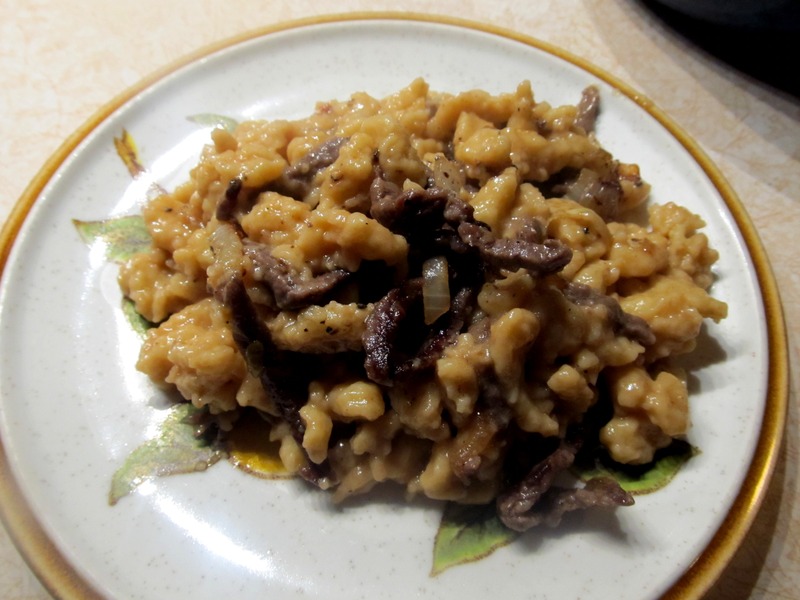 Beef and spaetzle is my kind of comfort food! This entry was posted in Recipe and tagged comfort food, german noodles, main entree, side dish, spaetzle. Bookmark the permalink. 4 Responses to Comfort Food Anyone? I am glad to be of help! Let me know if there are other things I can help you with. Hey! Someone in my Facebook group shared this website with us so I came to check it out. I’m definitely enjoying the information. I’m book-marking and will be tweeting this to my followers! Fantastic blog and terrific design and style. Howdy! Quick question that’s completely off topic. Do you know how to make your site mobile friendly? My blog looks weird when viewing from my iphone4. I’m trying to find a theme or plugin that might be able to correct this problem. If you have any recommendations, please share. Appreciate it!